Lightweight steel frames, reinforced concrete, specially-formulated closed-cell rigid polyurethane foam and ferro-cement are the key components of this innovative building method. 'Compu' stands for 'combined PU' (rigid polyurethane foam), the core of every Compu-Home™. Closed-cell PU foam does not absorb moisture. Closed-cell rigid PU foam has exceptional thermal properties and boasts a 'k' value of between 0.018-0.023 W/mK. The lower the 'k' value the better the insulating ability. 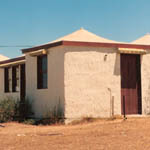 In comparison: Concrete = 1.250; Brick = 1.150; Glass = 1.050; Wood = 0.144 and Expanded Polystyrene = 0.039. 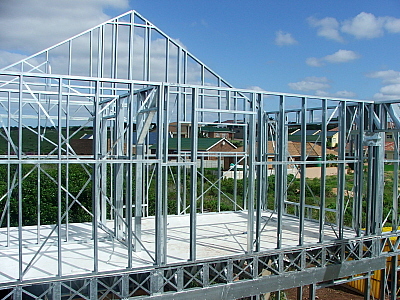 Computer-designed lightweight steel frames form the structural framework of this alternative building method. Tight tolerances are maintained and the design of multi-storey buildings is possible. Skilled labour is only required to assemble the framework and apply the PU foam and elastomer roof coating. Lightweight cladding and roofing materials result in reduced steel requirements and costs, without compromising strength and durability. The patented Compu-Homes™ building method ingeniously incorporates polyurethane foam into the wall's structure. Our completed walls are essentially the same as the exceptionally strong hulls of ocean-going ferro-cement yachts. They have been classified burglar-proof. Polyurethane foam is also integrated into the roof structure, thereby eliminating the need for further ceiling insulation. The result is an attic free of drafts or extreme temperature fluctuations, an ideal additional room. The polyurethane thickness can be increased on-site to suit extreme climate conditions without re-calculating or adding to the cost of the building's structural framework. Polyurethane foam/elastomer is sprayed on-site. Compu-Homes™ offer a viable alternative to conventional construction methods at a time where skilled labour and conventional building materials are costly and in short supply. Our specially-formulated polyurethane foam consists of two components. These are sprayed on site where they expand almost 30 times within seconds. Two 220kg drums of unmixed material effectively represent 60 drums of expanded material. This dramatically reduces transport costs and construction time when compared to conventional building and cladding materials. We do not transport 'air', i.e. insulating panels/blocks, to the building site. 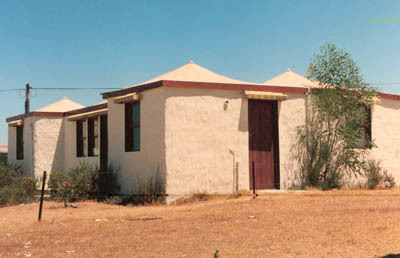 The Compu-Homes™ building system is incredibly versatile: In its basic form it is ideal for emergency housing. By incorporating the latest technical improvements it can be adapted for multi-level villas in affluent residential areas. Both structures display unbeatable insulating properties. 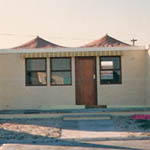 July 2010: Our modular Compu-Homes™ system has been adapted to the construction of coldrooms and freezers. By omitting or shifting interleading walls a multitude of 3m x 3m modules can be arranged in any configuration to suit individual space and cooling requirements. Ideal for farming communites. 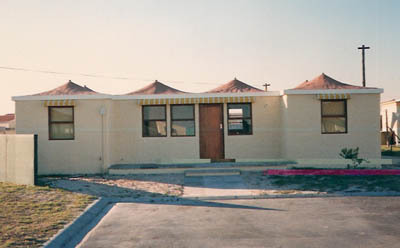 Initial Compu-Homes™ have a 28-year track record in South Africa and over 65 years internationally. The Compu-Homes™ building system is protected by valid patent and Trade Mark rights (South African Patent No. 2008/08546). It was also extensively tested by Agrément South Africa and the Council for Scientific and Industrial Research in South Africa (CSIR). Broadminded investors keen on supporting innovative energy-efficient technology with potential in all areas of construction are welcome to contact us. Please enquire. 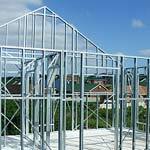 Lightweight steel frame contractors wishing to build superior energy-efficient structures using the Compu-Homes™ cladding system will be licenced and trained. Licenced contractors may be selected for potential tourism projects, both locally and internationally. Please enquire.